One biologist made a surprising (and colorful) discovery with an ultraviolet flashlight in a Wisconsin backyard — North America’s flying squirrels actually do glow hot pink. Martin recruited a team of researchers, including then-undergraduate student Allie Kohler, to investigate the flash of color. The team gathered specimens from a Minnesota Science Museum. To expand the search, gather more specimens and confirm their pink theory, Kohler and the team also went to the Field Museum of Natural History in Chicago. 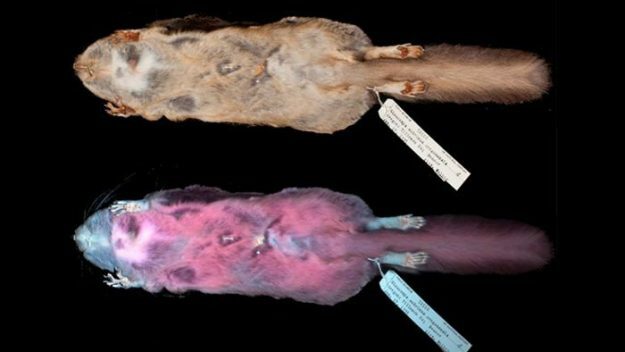 In an article published last week in the Journal of Mammology, the researchers wrote that they studied 135 museum squirrels specimens in total, and found only members of the Glaucomys genus — New World flying squirrels — glimmered pink. Researchers are not sure why the creatures’ fur turns pink, but they think it might help them recognize each other when there isn’t much light, the team told Newsweek. The bright color could also possibly help them avoid predators, such as owls, which also fluoresce in the same hue themselves, so a flying squirrel may look, superficially at least, like a flying owl. But the researchers say future work still need to delve into what’s behind the Day-Glo hues. If it’s confirmed that the squirrels see UV, the color might also have something to do with mating or signaling to other flying squirrels. As the research develops, she said, the importance of this find will present itself more clearly.